In real life and on social media, Americans disagree about a lot of things right now. You may be thinking that the sentiment “there’s far more that unites us than divides us” is totally passé — but there’s at least one thing we can agree on: dogs are the best. That’s the inspiration behind the “DoggoLingo” episode of Amanda Montell’s language-focused web series, The Dirty Word, which focuses on (you guessed it!) the language we use to talk about our puppers. Words like doggo, pupperino, and floof aren’t technically considered part of the English language (yet), but they’ve taken off in a major way — and Montell is here to help us get a firm grasp of the lingo. After all, we don’t want to miss out on any amazing dog conversations, right? For this very important episode of The Dirty Word, Montell was joined by special guest Maddie Sensibile (editor at Obsessee and fluent speaker of DoggoLingo). Among these relentlessly cute words, “floof” is one of my personal favorites. The noun, which sounds like something out of a Dr. Seuss book, is used to describe an incredibly fluffy dog. To get all the details about words like blep and how to appropriately use them in a sentence, watch the full video of Montell and Sensibile breaking it down. 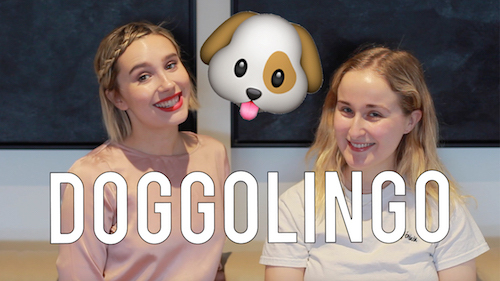 You’ll be fluent in DoggoLingo in no time — so, when you need a break from political debates, you can fall back on this universal (and adorable) language.